EVER SINCE “Professor” Park A. Van Tassel, a local saloon owner, launched Albuquerque’s first hot-air balloon in 1882, the city’s affinity for lofty recreation has gone hand in hand with a taste for the unusual. This month’s Albuquerque International Balloon Fiesta (AIBF), the largest celebration of its kind, offers a full nine days to explore ballooning from every perspective. No visitor should miss the iconic on-field experience, where some 500 orbs inflate to sizes of 80 feet before gliding skyward, but it’s hardly the only magical way to experience AIBF. From a bike ride that slips past the notorious fiesta traffic (now that’s magical) to splashy balloon views from a kayak, these five off-the-beaten-path outings offer fresh ways to take in the drama of the skies. It’s a tradition to share a fizzy toast after a first-time balloon ride. At the AIBF viewing parties held at the award-winning Gruet Winery, sparkling-wine enthusiasts can forgo the ride and get straight to the toast. Attendees sip mimosas and snack on scones, fruit, and other breakfast fare while watching the balloons drift over the vineyards, their sky views nearly unobstructed thanks to nearby I-25. Be sure to dress warmly; the west side of the winery, where the party takes place, is in the shade. To get an insider’s look at all that it takes to fly a hot-air balloon, visitors can volunteer as crew members (see “Suspended Animation,” p. 17). Cindy Moores, team leader of chase-crew volunteers for the fiesta, insists that no experience is necessary—early arrivals can simply come to Balloon Fiesta Park on the Wednesday through Friday prior to the fiesta to sign up. (Same-day volunteering is possible, but not recommended.) Some of the specially shaped balloons require several dozen crew members, so there are always plenty of slots to fill. Fitness is a virtue in the volunteer crowd—balloon envelopes weigh several hundred pounds or more—but Moores promises she can find suitable tasks for everyone, including crowd control, holding open the throat of the envelope, holding the crown line, or, for those familiar with the area, driving a chase-crew vehicle. Hard work, as usual, pays off: Volunteers receive a pass to attend the remaining fiesta events for free. For a serene, unforgettable viewing experience, travelers can opt for an early-morning kayak trip with Quiet Waters Paddling Adventures. Tours depart before daybreak from the outfitter’s Bernalillo offices, where guides match participants with kayaks and paddles. From the put-in in Rio Rancho, the tour floats eight and a half miles down the Río Grande, past Balloon Fiesta Park, which lies just east of the river. Away from the crowds, the only noise is the gentle flow of the current, paddles dipping into the water, and burners firing as the candycolored envelopes glide overhead. Some balloons stay high over the river, dropping collectible trading cards for paddlers to pick up, while other pilots “splash and dash,” touching their baskets down in the water just yards in front of the kayaks before sailing off. Midway through the trip, participants beach their Day Trippers and Top-Siders on a sandbar and muck through the river clay for sips of hot chocolate and bite-size muffins. In addition to the balloon views—and there are plenty—the trip is a fantastic way to explore the Río Grande. Prior paddling experience isn’t necessary; the waters are calm, and the expert, friendly guides provide instruction to novice kayakers. Participants should dress to get wet— paddlers are often soaked within minutes, despite the waterproof pants provided—and bring a change of clothes. Operated by the Anderson-Abruzzo International Balloon Museum Foundation, the Diamond Club is VIP all the way. Ticket holders zip past lanes of stop-and-go Fiesta traffic on their way to reserved parking at the International Balloon Museum. Inside Pugash Hall, attendees get the whitetablecloth treatment at a catered breakfast with items such as made-to-order omelets, frittatas, fruit, and a tempting spread of pastries. As the sun rises, visitors may choose to stay inside, viewing the festivities from floor-to-ceiling windows, or step out on the field-facing balcony to watch the balloons inflate and take off. Shuttles from the museum will cart visitors into the action if they wish, but most opt to stay close to the museum for the opportunity to thaw their toes inside and take in an elevated view of the field. Volunteers are on hand to announce balloon names as they glide directly over Diamond Club members’ heads. The Bikes & Balloons tour from Routes Rentals gives spectators another way to beat Balloon Fiesta Park traffic—and a morning blast of fresh air and fitness to boot. The intermediate/advanced tour begins at 5:30 a.m. at Los Poblanos Historic Inn and Organic Farm, where Routes owners Josh Arnold and Heather Wess fit riders with bikes and helmets. Josh proves a worthy leader, carting breakfast burritos behind him to entice riders along Río Grande and Montaño boulevards to the Paseo del Bosque trail, a vehicle-free route that traces the river, and up the Paseo del Norte bike path. Much of this route is flat, though the final ride up the thoroughfare to Balloon Fiesta Park involves three short climbs. For riders who prefer to take it easy, Routes Rentals is introducing a beginners’ trip this year. No matter which course riders follow, there’s little to break the predawn calm other than the thrum of bike tires against the pavement and the information offered by the knowledgeable guides. The ride pays off with prime parking—tour participants park their bikes feet away from the entrance gate, closer even than the park’s regular bike valet—a ticket onto the field, and the promised breakfast burrito from Golden Pride. 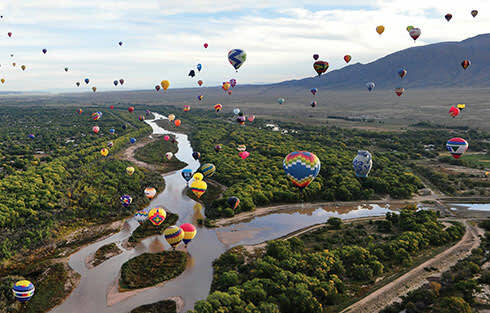 After watching the balloons take flight, riders set off on a leisurely return leg, marked by scenic views of the autumnal bosque and hot-air balloons dotting Albuquerque’s robin’s-egg-blue skies.